Getting a leisurely start from where it seemed unwise to drive farther up the old dirt road, I followed it the rest of the way to a saddle north of Wahguyhe, and a short distance down the opposite canyon toward Death Valley. Where the road started dropping too much, I turned northwest and up through the sparse piñon forest to regain a ridge. Suspecting that the peak would be non-obvious, I had programmed its rough coordinates into my GPS, and essentially navigated by “IFR” until I started seeing occasional cairns leading toward what seemed likely to be Grapevine. 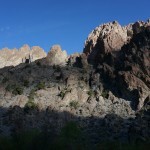 The route continued along the broad undulating ridge, occasionally dodging small cliffs and rotten rock outcrops. Nearing one saddle, I saw some animal crossing open terrain below, and jogged a bit to see what it was. 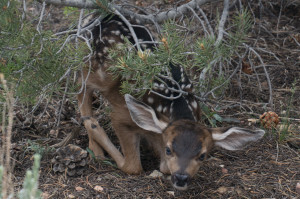 It turned out to be a young fawn, apparently incapable of either running or hiding, whose “survival” strategy consisted of walking over to the nearest piñon and crouching beneath it. Not seeing an angry mother nearby, I crouched down a few feet away to take some pictures before continuing on my way. It would have made an easy meal or pet, but I had plenty of tuna and little extra room in my car. 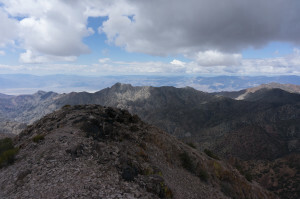 Reaching Grapevine’s summit, I hung out near the ugly radio equipment for awhile, taking in Ubehebe Crater to the west, Death Valley proper to the southwest, and scattered rain showers over Nevada to the east. Then, with less-than-impressive aim, I headed back to the saddle at the end of the road, continuing along the ridge in the other direction toward what I thought/hoped was Palmer, the area’s other DPS peak. 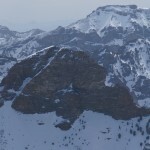 This was, in fact, Wahguyhe; Palmer is southwest of the saddle, along another, longer ridge. 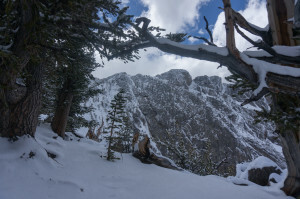 Not wanting to descend the talus-field, I headed east on the ridge for awhile, then bombed down through the woods, finding mostly dirt and pine duff that made for excellent boot-skiing. Minor bushwhacking led back to the road, and a short jog later I was back at my car, pleased to find that my patched tire was still behaving itself. 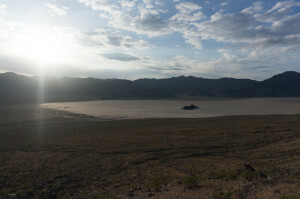 The Racetrack is a famous Death Valley feature, a large dry lake with strangely moving stones. 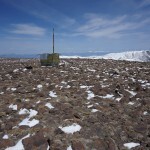 Recent research using GPS sensors and time-lapse photography has shown that the rocks move under light winds while embedded in large, thin, melting sheets of ice during the winter. The dry lake, or playa, has the scaly appearance of a dried-up mud puddle, but is hard enough when dry that walking on it leaves no marks. 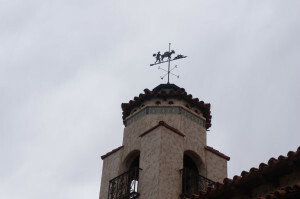 I had read about the Racetrack and seen pictures many years ago, but it was always one of those things that was too far off in the middle of nowhere to visit. 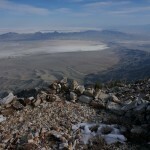 Standing on top of Dry Mountain the day before, I realized this was probably my best chance to see the thing. 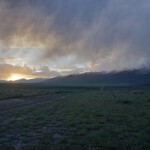 Waking at dawn near Teakettle Junction, I drove the final bone-jarring miles to the Racetrack, parking near a large camper at the trailhead for Ubehebe Peak, at the north end of the playa. Unsurprisingly, the “no camping” edict was not enforced. 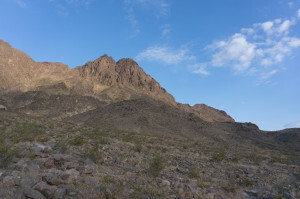 After going for a walk on the northern end of the lake, I headed up the trail for Ubehebe Peak, more to get a better view of the Racetrack than to bag the summit. I met the owner of the camper along the way, a retired park ranger who had served in parks as far north as Wrangell-St. Elias. We talked for awhile, then he descended to look for “racing” rocks, while I continued toward the peak. Though it is hard to judge scale in the desert, this is actually a 1900-foot climb, though there is a decent trail most of the way. After sweating my way up through the black rock and flowering creosote, I lounged on the summit for awhile, watching the others wander around the huge playa looking for the famous rocks. I jogged the descent, then drove to the southern end of the lake-bed, where the rocks are supposedly more likely to be found. Spying a likely-looking candidate from the road, I parked and walked a few hundred yards out to what proved to be a football-sized, rectangular black rock. This rock had apparently not moved recently, as its track had faded to near invisibility, but it was still neck-and-neck with a nearby lizard. Wandering around the area, I found a few smaller rocks with slightly more obvious tracks, but none trailing the deep, obvious gouges found in the brochure. 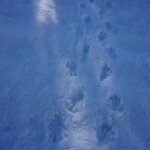 Maybe I needed to look in a different area, or come back in early spring when the tracks were freshest. Having spent most of the morning sight-seeing, I took the wretched road back north to do some “work” and tag Tin Mountain, Dry’s neighbor across the valley. I pulled off the road at a likely starting-point, then watched the afternoon thunderstorms build as I had lunch and made my sandwiches. 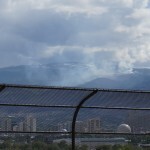 Though Dry was spared, things turned ugly above Tin, so I gave up on the summit and played tourist. 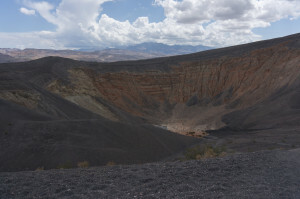 Next up was Ubehebe Crater, a volcanic blast crater north of Tin Mountain. Despite there being an obvious (and obviously-fun) path straight down to the bottom, I was the only person to run down and slog back out. Part of me wanted to do a couple more intervals, but that would have been ridiculous, so I emptied my shoes and continued my tour. 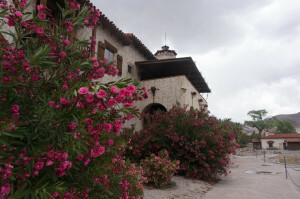 The final stop was Scotty’s Castle. Seeing it on maps on previous Death Valley crossings, I had assumed it was just a castle-shaped rock formation, but it is actually a castle-themed mansion, built in the 1920s by a crazy rich man befriended by a local con man named “Death Valley Scotty.” There are tours, and with them tourists, but I was content to just walk around the outside, admiring the flowers and the collection of water and diesel generators in use over the years. Evidently the water generator, like the carillon and tower clock, still works after almost a century. Retreating to my car under the threat of rain, I drove into Beatty (motto: “We make Tonopah seem cosmopolitan.”) to get my tire patched. With an extreme climate and a fair amount of truck traffic, the town supports a healthy tire-repair business, though this seemed to be the slow season. What I thought was a nail puncture was actually caused by my driving too fast over sharp rocks (surprise, surprise), so while the guy put in a patch, he advised me not to trust the tire. 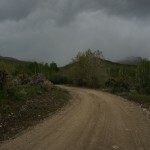 After grabbing a few apples (choice of “green” or “red”) at what passes for a store, I returned north, then very gingerly drove miles of dirt road toward camping near Grapevine Peak. 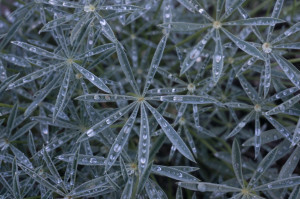 My plan for this season was driven by (changing) climate, with the increasingly-normal dry California winter convincing me to start in the Sierra. Unfortunately climate is not weather, as this past week has proved, and I must adapt. 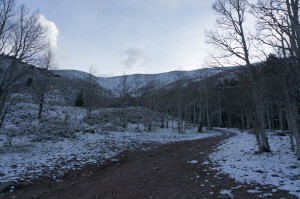 After filling up in Ely, I drove up to Timber Creek Campground, where a dusting of snow from the previous day’s storm was taking its time melting. 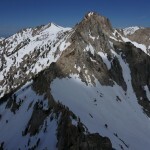 My goal up here was North Schell Peak, one of two ultra-prominence peaks in the area I had yet to tag. 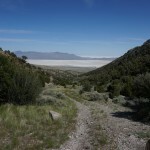 (The other, Ibapah, is something like 100 miles of dirt from the nearest pavement, making it unappealing.) The forecast for the next day called for cold and wind, but relatively little precipitation, so this was the best chance I would have. Thanks to the time change, I was on the trail at 6:10 without an alarm, easily following the faint climbers’ path under the dusting of snow. 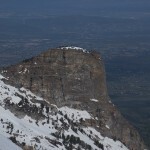 I had downloaded the route description the previous day, but mostly ignored it, as I could see the peak from the car. 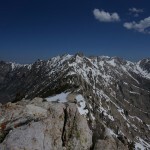 Despite North Schell having 5,400 feet of prominence, the climb is only 2,500 feet and a bit over two miles. 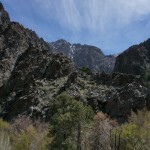 The trail follows the north branch of a stream, circling around the west side of the peak as it climbs. Where it finally disappeared under an old snowbank, I continued along the stream, then followed game trails north to gain the ridge, where I had my first taste of the eyeball-freezing wind. 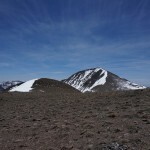 As I gradually realized, I had emerged well northwest of the summit, and so had a long, cold traverse back to reach it. I meandered back and forth, trying to optimize my route over loose scree, grass, and drifted snow while occasionally turning to warm my right eyeball. Finally reaching what I thought was the summit, I saw the actual summit another quarter-mile to the south. By this time my feet were getting cold, but it was too cold to stop and put on plastic bags; I just had to get it over with. 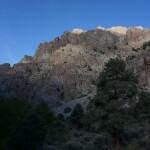 I slogged on to the summit, where I savored the experience for all of five seconds before retreating along a more direct route to the stream and trail. The whole experience had taken a mere two and a half hours, leaving me plenty of day to do something else. 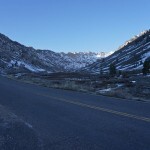 I was headed along highway 6 to Bishop, which passes right through the White Pine Range, one of the better of Nevada’s many small mountain ranges. Stopping in the Ely McDonald’s for breakfast and internet, I determined that the loop over Currant and Duckwater Peaks would be right along my way, and should be feasible in the long afternoon if the weather held. Leaving the highway toward the White River campground, I followed the good dirt road for 10 miles, then turned left on the slightly less-good FR-407, and right on a much worse spur road. 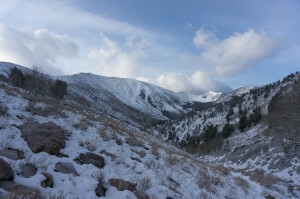 Parking near a rock dike protruding into the ravine, I watched some graupel pass, then put some more warm clothes in my pack before starting up the deteriorating road toward Currant’s impressive summit crags. The route description mentioned following an old logging road to enter a ravine, but the main road and adjacent fields seemed much easier, so I just did that, leaving the road to follow deer- and cow-paths straight up open terrain. 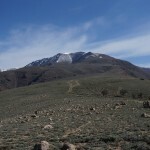 As the path of least resistance headed too far north, I left it to follow a ridge heading southwest toward what appeared to be Currant’s summit. 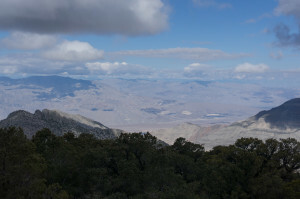 The ridge was a mixture of manageable pine forest and rock outcrops; the rock, reminiscent of Eagle Peak near Death Valley, was incredibly sticky when dry or wet, though much less certain when covered with fresh wet snow. 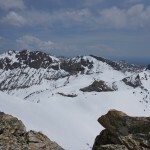 I stayed on the ridge crest to avoid side-hilling where possible, though a couple of narrow sections and serrations forced me into the ankle-deep snow on the southeast side. Showers constantly threatened to the south and east, but for some reason stayed where they were. One final, larger serration near the top forced me to detour 100 feet down the south side, until I could scramble and slide into a gully returning me to the base of the summit slabs. Being super-sticky rock, this class 3-4 slab would have been a quick romp when dry, but was somewhat more complicated when covered with patchy ice and snow. It was still fun and non-threatening, but kicking steps, sweeping off foot-holds, and routing around difficulties took time. After a few final, somewhat more tenuous moves, I reached the summit ridge, to find I was well north of the summit, and in for some Serious Business. 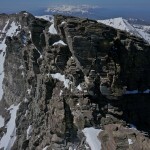 Currant’s north ridge extends in a long, jagged knife-edge well north of the highpoint. 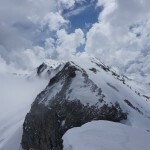 Most of the climbing is only class 3-4, but with the snow obscuring the angle of the top of the ridge, it was slow and sometimes nervous going. On a couple of the steeper narrow sections, I was forced to go a cheval, an uncomfortable maneuver on sharply-textured rock. 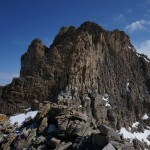 The crux was a rotten drop just after a cairned sub-summit. Kicking off as much of the snow and loose rock as I could, I downclimbed about 6 feet to a gently outward-sloping ledge, psyched myself up, then jumped the remaining 6 feet to a dirt flat on the next part of the ridge. Desert peaks aren’t supposed to be that hard! Currant had taken more time and mental effort than I had expected, so after glancing at Duckwater, I headed down Currant’s standard route without hesitation. Unfortunately, the top of the chute one is supposed to follow is not obvious from above, so I got to spend some quality time cliffing out in other, lesser chutes filled with thigh-deep slush. I eventually found my way to the bottom of the correct chute, then postholed my way down a ravine to the bottom of the snow. Other than some dry-falls that required a little scrambling to bypass, the rest of the hike to the car was straightforward. I found the “old logging road,” but it was almost invisibly faint, and near-invisible where it joins the main ATV track. I returned to highway 6 by following FR 407 south, which was rougher but more direct than retracing my route. 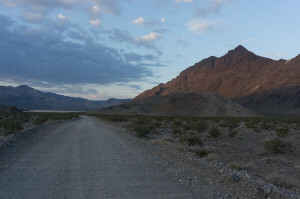 After filling up at the secret ghetto station in Tonopah — one of the most depressing towns in America — I drove on into the night, crossing Montgomery Pass into California before pulling off on a well-graded dirt road to sleep. Though it was bare dirt when I nodded off, I woke to find a half-foot of snow outside. Fortunately I had four-wheel drive, because otherwise I would have been stuck until someone decided to wander down this random road to nowhere. 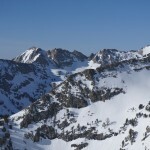 With 6″ of snow at 7,000′ in the Whites, there has to be well over a foot in the Sierra. In the short term, weather trumps climate. 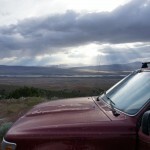 This was the first of two “snow, drive, four-wheel drive, desert” days, turning pairs of easy peaks into full days. 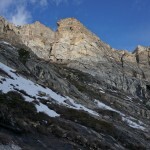 Hole in the Rock, named for the obvious feature, is the highpoint of the East Humboldt Range, which is really just a northern extension of the Rubies. 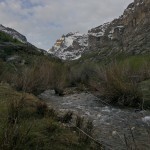 After camping as high up the dirt road as I could reasonably drive, I hiked the remainder to the Snotel station, near a marsh at the base of a broad cirque. Both the hole and the route to the summit — up a couloir to its north — were obvious from here, but it was less clear how best to deal with the mixture of slush and brush between me and the couloir. I ended up doing the worst thing possible on the way up (high and south, with high-angle slush), then finding the right thing to do on the way down (low and north, with moderate brush). 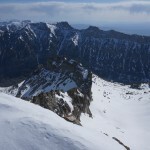 A recent wet avalanche in the couloir had scoured off the top layer of slush, but it was still slow going, so I climbed the rock to its left where possible, occasionally kicking steps across or wading through bits of snow. 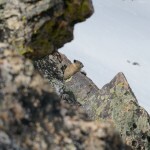 Reaching the ridge, I was surprised to see two high-altitude coyotes exiting the couloir. 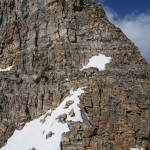 Even on the ridge the snow was a slushy mess, so I stuck to the rock near the sheer south side where possible. I had hoped to traverse south over the hole, then tag the next named peak south, but I was almost immediately stymied by a large gap in the ridge, vertical-to-overhanging on the other side. Passing this gap would require descending several hundred feet to one side or the other, and I was not sure I could easily regain the ridge after that, or that I would not run into similar problems farther on. Instead, I returned the way I had come, reaching the car around mid-day, and moved on to the next thing. 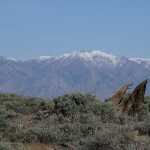 Pilot is an ultra-prominence peak rising over 5,000 feet from the western edge of the Great Salt Desert. After a brief stop in the depressing town of Wendover, I drove into Utah, then back into Nevada on the dirt road leading to Pilot’s east side. I forgave my car its poor mileage, as I was able to follow the increasingly rough dirt road up Miner’s Creek all the way to its end, saving me 1000 feet of desert-hiking. 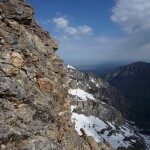 Pilot is a giant, brushy rubble-pile, and the climb is a matter of finding the path of least resistance for about 4000 feet. While I saw a few cairns, I never found a real trail, despite a survey crew having built a pack trail in the 19th century. I followed the south (shady) side of Miner’s Creek for awhile, then crossed into the sun where a solid rock rib climbed the north side. 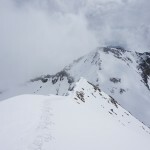 I followed this rib, more solid and open than the surrounding slopes, to the main north-south ridge, then continued along that to the summit, crossing several intermediate humps. 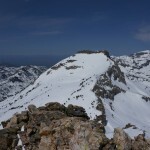 I found my rhythm on the climb, and was pleased to reach the summit in 1h40, a good early-season ascent rate given the terrain. I found the usual desert register mailbox on the summit, as well as a half-dozen or so rock structures, some of which were supposedly built by the survey crew. 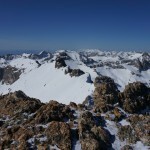 The snowy Rubies are visible to the southwest, Ibapah to the southeast, and to the east, the white wasteland of the Salt Desert, with its black, desolate “island” peaks. After some loitering, I made a leisurely descent, then made the trippy drive across the Salt Desert at dusk before finding a place to sleep. Hole in the Rock from camp. For my last day in the Rubies, I had planned to do Gilbert and Sullivan Silliman (and had even contemplated the obvious joke). Unfortunately, yet another warm night made almost everything slush, and I can only tolerate so much of that. The traverse over “Mazamas” to Sullivan looks interesting, though, as do several other nearby ridges in this area of intersecting glacial valleys. I got started at 6 AM, hoping to reach the northeast-facing snowfield that is the obvious route up Gilbert before things got too grim. Bob mentions taking a trail on the east side of the stream and fording back higher up, but fortunately the ad-hoc wooden bridge system near the trailhead was partly submerged, so I tried an apparent trail staying on the west side of the raging river. 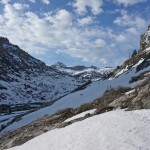 This trail seems unofficial but well-traveled, with frequent cairns and well-established tunnels through some of the dense vegetation, finally ending at a snowfield below an avalanche chute. Bushwhacking up this canyon would be a nightmare. 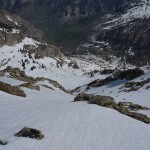 The avalanche runout was soft but firm enough to walk across in running shoes, but other snowfields were slush. 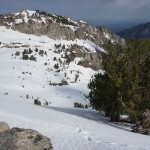 I put on snowshoes near a large cascade, then put in 2,000 feet of wretched slogging. 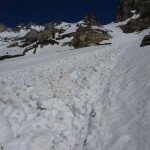 Though I occasionally managed a few steps on the surface of the snow, I spent most of the climb either punching through soft crust, sinking a few inches into slush, or backsliding when the surface cut loose. 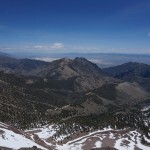 At the first opportunity, I crossed to Gilbert’s northeast ridge, where I wrung out my socks and considered the rock ahead. From below, the ridge seems to have two large gendarmes, and I was afraid that I would be cliffed out on the uphill side of the first. However, both turned out to be well-behaved, and the climbing — steep, exposed, easy third class — soon cheered me up after the endless slog. Reaching the summit with a final 100 yards of snowshoeing, I looked southwest to Silliman and felt a distinct lack of enthusiasm. 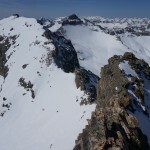 Dry or with good snow, the scramble over Mazama would probably be fun. 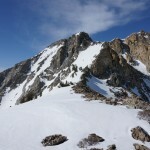 However, it looked like much of the climb on Sullivan would be on east-facing snow, and the tricky traverse off Gilbert (the connecting ridge has a big vertical-to-overhanging step) would be wet and slushy. Not today. Instead, after a nap, I wallowed, slid, and glissaded back down the northeast side. I was surprised to see a boot-pack joining my snowshoe-tracks partway up. 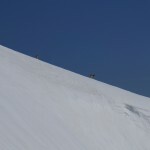 Though I never saw the person making it, I suspect he was a local skier, as he seemed to know where to go, and did not just follow me to the ridge. I met two other groups lower down — the only humans I have seen on the trail in four days in the Rubies, or indeed since Elwell last week, and probably the last I will see for awhile. The friendly man who gave me a ride back to the car suggested Verdi’s south ridge, across Lemoille Canyon from Thomas and directly above the current end-of-road, as another good scramble. 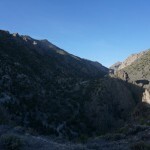 To make more of a day of it, I hiked up to the head of the canyon, climbed up a chute to the crest, and followed it all the way north to Verdi, about 5 miles in a straight line. This added a bit of sight-seeing, a lot of walking along a ridge, and a bit of sketchy scrambling over Point 10,810′, the only peak where I found a register. 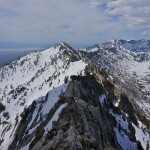 I don’t know a good way to reach the ridge, but I would recommend scrambling between Verdi and the saddle south of 10,810′; the rest is forgettable. 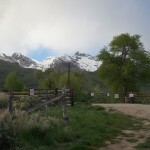 Waking up again in Lamoille Canyon, I hiked the same road, continuing to the normal parking lot at the head of the canyon. From there, I followed a maze of snowmobile tracks more or less south, aiming for a notch at that end of the valley. Even at 7:00 AM, snow catching the morning sun was becoming soft, and the tracks were a bit harder. 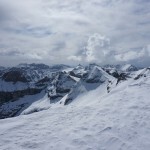 I put on crampons and picked the shadiest, most snowmobile-trafficked line I could find, and eventually reached my target. Not having a good map of the area, I checked if the summit to the west was anything. It wasn’t, but the higher thing to the east has a “Favre” benchmark, which shows up on the USGS 7.5′ topos. Almost all east-facing snow was wretched slush by now, so I stayed almost entirely on rock for the traverse north to Verdi, which may have made some parts considerably harder. 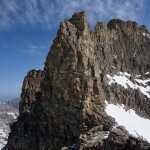 From Favre, I dropped down some 3rd-class rock to where the ridge leveled out, then began the long, not especially exciting, but usually-pleasant walk I had expected based on my view of the ridge the day before. 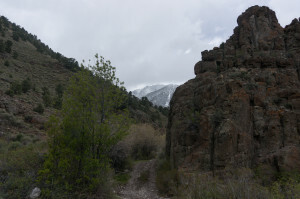 A couple of the lower sections were a bit brushy, and sticking to the rocks led me into difficulties on occasion, but it was a fast walk until near Point 10,645′. 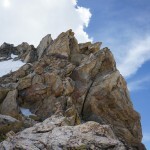 I probably could have avoided it, or found a walk-up, but seeing it was made of knobby, golden “hero rock,” I had some fun taking the direct, 3rd-class way to the summit. 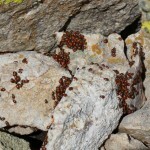 For once, there was no cairn, but there were once again creepy swarms of ladybugs. The ridge north starts off broad, but the crest itself narrows to fun “exposed sidewalk” sections and a bit of easy scrambling, becoming slightly more difficult near 10,811’s summit. The unexpected register held signatures from three parties over the past 24 years, an indication of the peak’s popularity. 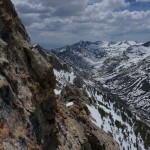 To my surprise and dismay, things quickly got sketchy on the knife-edge ridge north of 10,811′. After some experimenting, I found a magic foot-ledge on the east side of a “beak” on the ridge, making it possible to follow the crest itself. Shortly thereafter, there was a dicey step-down-and-around onto a sloping slab, followed by an undercling and various careful adjustments to get down the slab and regain stability. Both could probably be avoided by dropping down the east side, but that was steep, hellish slush. After these difficulties, the scramble to the saddle with Verdi was more normal 3rd class. 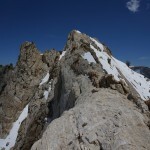 Verdi starts with a vertical step that must be bypassed on one side to regain the ridge crest. I chose east, and found a steep sketchy mix of good golden rock, okay black, and unnervingly crumbly white. It worked, but I saw that going west would probably be easier. 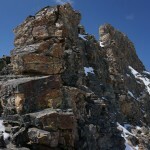 Once past the step, the rock improves, and the best path usually lies along the crest or to its west. 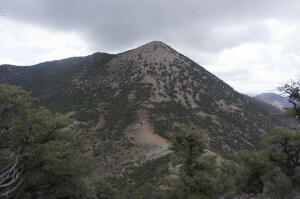 I was physically and mentally a bit worn by the time I reached Verdi, and so did not consider the additional 2-mile trek to Smith Peak. The first part of the ridge looked interesting, though. 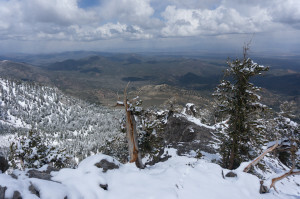 Instead, I soaked in the view for awhile, then headed down what I hoped would be a quick boot-ski to the car. 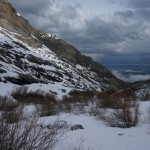 Not so much: the snow was intermittent, often too soft, and broken by melted-through cascades. Getting around these was often a battle through steep tick-habitat, but I have become fairly tolerant of such things. 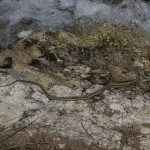 Finally reaching the road, I was cheered to see a garter snake apparently drinking from the stream. Why must they do this? 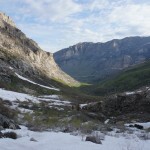 The Ruby Range’s best-known feature is Lamoille Canyon, a huge U-shaped glacial valley with several tributaries. Rather than immediately exiting the range, the Lamoille glacier carved its way north along its spine for several miles before turning west. I wanted to spend at least one day exploring this area, and picked out some peaks at random, based on my road atlas’s low-resolution topo and knowledge of the class 2 route up the first peak, Thomas (named for a man who died rescuing students on an ill-advised winter trip). A paved road leads most of the way to the valley’s head, though I found it blocked by snow at the “Terraces,” a few miles from the end. I hiked the road until I was across from the stream leading down from Island Lake, then took off straight up the brushy hill, eventually reaching snow near a bridge over the outlet stream. 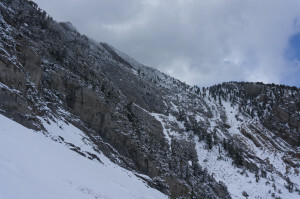 As the slope steepened and the chute leading up Thomas’s east ridge became visible, I put on crampons — no snowshoes today — and cranked out the elevation to the ridge. 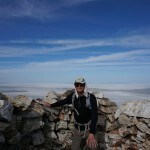 Crossing the ridge, more of a broad plateau, I tagged both of Thomas’s summits, finding the survey marker on the north one. Then things got tricky. Glacier-carved ranges tend to have U-shaped valleys, and these valleys can be separated by sharply-carved fins, knife-edges, and horns; the rest of my day consisted mainly of dealing with these features. Dropping down Thomas’s south ridge, I opted for the steep snow-slope to its east rather than dealing with the partly snow-covered knobs on the ridge itself. This worked for awhile, but the snow eventually turned to wretched slush, so I returned to the ridge crest, where I found easier going than I had expected. This ended at a large step I had noticed on the way up. 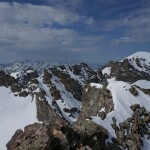 I bypassed the first overhanging drop by descending on the snowy, shaded west side and following a ledge back to the ridge. At the next overhanging step I downclimbed the dry rock on the east, then crossed a bit of snow before regaining the ridge-top. Full House itself was a simple class 2-3 affair, with none of the impassable steps found on the way down Thomas. 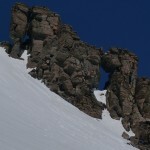 Its south ridge was a bit trickier, but not too hard. 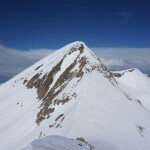 All I knew about Snow Lake Peak was that it existed, and perhaps, subconsciously, I thought that a peak named after a nearby lake would be easy. It sure didn’t look that way from the north, with a steep, knife-edge ridge with a couple steps leading to the summit, and a sheer north face. I thought it would probably be a walk-up on the other side, but decided to try the ridge before going around to the south. 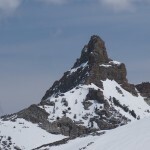 The peak appears to be made of steep, terrible rock, but other than loose stuff lying around on flat surfaces, the rock is surprisingly solid, with abundant features making some near-vertical sections no harder than 4th class. 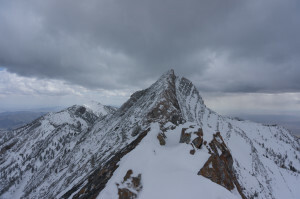 It was, however, relentlessly exposed, and between the loose rock on ledges and the occasional snow wetting my soles, I found it a worthy climb with my current atrophied scrambling ability. 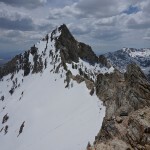 Reaching the summit, I realized that I was standing on a perfect glacial horn at the intersection of Lamoille, Thomas, and Stoddard Creeks; there was no easy way down. 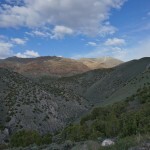 With good weather and plenty of daylight, I decided to continue to Fitzgerald, the next peak west around Thomas Creek. Snow Lake’s west ridge was slightly easier than the northeast, but still involved lots of exposure and a few steep 4th class downclimbs. 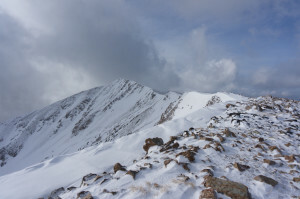 Glad to be back on snow, I picked and post-holed my way along the ridge to Fitzgerald, visiting the cairns at each end of its summit cat-walk. I even took a bit of a summit nap in the sunny calm. 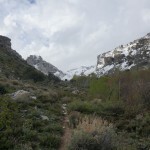 I thought about finishing the traverse by tagging the apparently-unnamed peak between Thomas Creek and the Right Fork of Lamoille Creek, but decided to simply drop to Thomas Creek, take its trail back to the road, and walk the road up to my car. This would hopefully involve less post-holing than returning east to the road’s end. 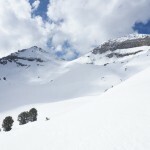 The return was hugely unpleasant, with endless ankle- to knee-deep slush sometimes combined with shrubbery. 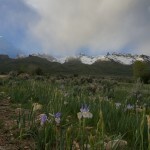 However, when the obnoxious afternoon thunderstorms returned, I was glad to be in the bottom of the valley. The road-walk was longer than expected, but a friendly local offered me a ride for the last bit. 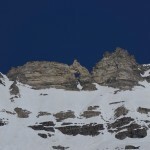 He had spent most of his life in the area mountains (heli-skiing! ), and had some suggestions for more to do in the Rubies. 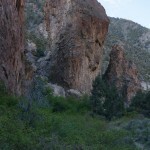 Some other locals I met mentioned some rock climbing in the area, and I see a dozen or so route on Mountain Project. There is probably much more scrambling and climbing to be found; too bad it’s on the back side of nowhere. 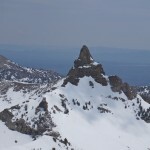 Ruby Dome is the highpoint of the Ruby Mountains, southeast of Elko. 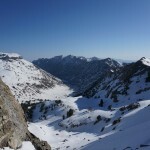 Nevada’s most alpine range, they are said to somewhat resemble the Sierra Nevada. 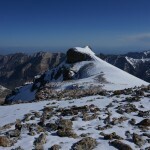 The highest, northern part has been thoroughly carved by ancient glaciers. 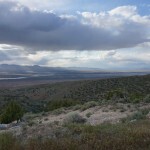 Unlike most Nevada ranges, which look like someone dumped a pile of rocks in a flat wasteland, the Rubies are split by an impressive network of deep, U-shaped valleys, with little subsequent V-shaped stream erosion. With their glacial valleys and horns, they remind me of Glacier National Park, but with better rock and desert brush. After camping a few miles away, I drove to the locked gate that is Ruby Dome’s inconspicuous “trailhead.” Dawn revealed ominous clouds above the mountains, and the forecast promised more bad weather, but I hopped the fence, walked through the private campground, and found a well-signed trail leading along the creek toward Griswold Lake and Ruby Dome. 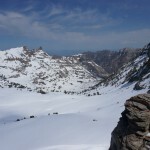 I had chosen to bring snowshoes, and was glad that I did; the snow started below the lake, and the previous day’s rain and a warm night had created a top layer of unconsolidated sludge. 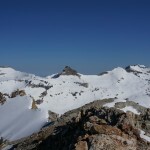 Circling the lake, I fought my way to the saddle to its east, then crossed the bowl toward Ruby Pyramid, thinking to keep my peak-bagging options open. 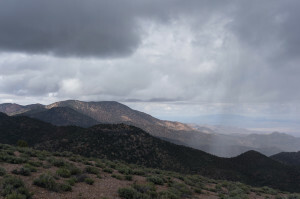 The clouds had fortunately failed to materialize, and I was able to get a view of the terrain from Gilbert to the east, to Ruby Dome immediately west. 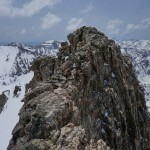 Finding the traverse to Gilbert unappetizing, I headed back west to Ruby Dome, where I found a massive summit cairn. The clouds had obscured Ruby Pyramid, but did not appear threatening, so I decided to continue west to Lee Peak before heading down. Passing a couloir I had seen from the approach, I noted that it would work for the descent, then continued on to Lee’s summit, awkwardly climbing a couple of rock steps in snowshoes. Descending, I was dismayed to find clouds rapidly rising from the valley, engulfing my just as I reached my couloir; visibility was instantly reduced to “useless.” Unlike elsewhere, the snow in the couloir was too hard to kick steps with my snowshoes, so I slid into the void in self-arrest position, then glissaded until things flattened out more. I spent awhile heading generally downward in uniform whiteness, occasionally glancing down at myself to give my eyes some variety. Still well above the lake, I emerged below the clouds, and the rest of the return was straightforward. 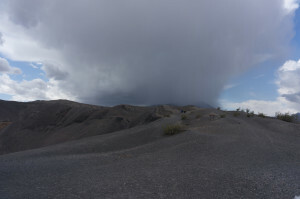 The mid-day thunderstorms formed behind me amazingly quickly, though, and I jogged the road back to my car as the thunder-hail started. 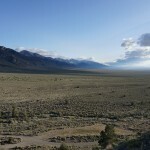 Northern Nevada has a certain ascetic beauty lying partway between the lifeless desert of central Nevada and the high plains of southern Wyoming. 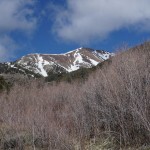 Star Peak is an ultra-prominence peak right off I-80 northeast of Reno. I saw it as I drove up a random jeep road that seemed to head in the right direction, and may have even summited the next day. The weather forecast was dismally accurate; I woke to what sounded like rain, rolled over to listen to a podcast, then actually looked outside to see that while it was warm, the precipitation was snow. I had no excuse. 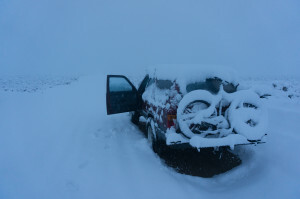 I dug my snow gear out of the back, then began squelching up the remainder of the road through inch-deep muck covered in a thin layer of snow. Where the road ended, I continued straight up a broad ridge past a sort of animal pen. I found a portion of what might have been an old road farther up the ridge, but mostly just wound through junipers, sage brush, and deepening snow. 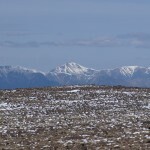 I eventually reached a cairn from which I could see nothing higher within the 100 yards of my snow-limited view. Continuing northeast-ish along the ridge past the summit a bit, I still saw nothing higher, and the snow was 5″ deep and still falling, so I turned around. I had hoped to loop over a couple of other peaks, but doubted that I could find my car unless I retraced my tracks. The crux was probably driving back to the highway. Returning to the car thorougly soaked, I managed to turn the key in ignition with both stiff hands, then carefully inched down the steep mud. Fortunately there were only two small uphills on the way to the valley floor, because I was essentially paddling up both, coating my entire car with mud while barely making uphill progress. After nearly three weeks of cooperative weather, my luck has apparently run out; tomorrow looks like more warm weather with thunder-snow. 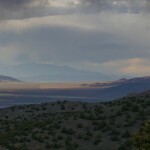 Jefferson and Arc Dome are two ultra-prominence peaks on opposite sides of a valley dominated by a giant tailings pile. 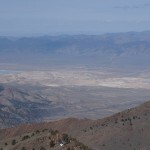 This valley connects US-50 (“The Loneliest Highway in America”) to US-6 near Tonopah (“The Saddest Town in America”). 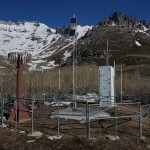 Jefferson is thoroughly mediocre, a broad dirt mound with jeep tracks leading most of the way to a summit festooned with weather station stuff. 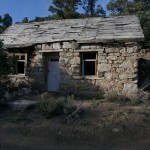 I camped in the ruins of Jefferson, an old mining settlement consisting of ten or so stone buildings of various quality, in various states of decay. I probably could have driven most of the road from there to the saddle south of Jefferson, but granola bars are cheaper than gas, and I was tired of driving. 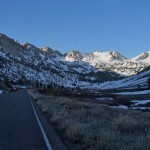 I walked the road to the saddle, where somewhat fainter jeep tracks on both sides of a fence lead up Jefferson’s broad south ridge. 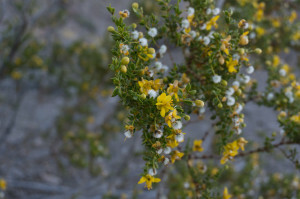 The Toquima Range is extremely dry, so there is little vegetation to give one a sense of scale, and the walk up the ridge seemed interminable. Reaching the summit, I found two sets of weather gear, the older one from the 1960s abandoned, its box left unlocked as a convenient shelter. I tried to take a shortcut down a side ridge on the way back, but got “desert cliffed out” (i.e. ran into steep thorn-bushes and talus) and was forced to retrace my steps, jogging most of the road. Arc Dome was probably my favorite outing on this trip through Nevada. 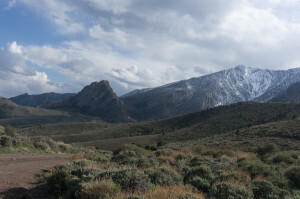 The peak itself is just a big pile of loose rock, but harder rock intrudes in the lower part of the eastern side of the Toiyabe Range: white granite domes to the north, and some dark metamorphic-looking stuff near Arc Dome. 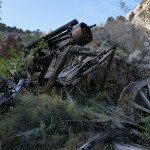 Starting from the valley floor, I followed the South Twin River trail through a pleasantly lush box canyon containing some old mining equipment. 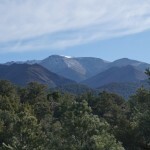 Near where the trail dies out, Arc Dome comes into view to the northwest. 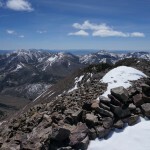 I followed sporadic cairns to a ridge, then suffered my way up all kinds of loose awfulness to the summit. 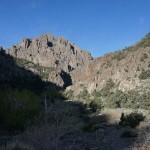 shown on the trailhead map. I never found this trail, but I did eventually pick up the sometimes-faint North Twin trail. Other than getting embarrassingly stuck in a cattle pasture, I had a pleasant run back to the North Twin trailhead, only a mile away from my car at the South Twin.